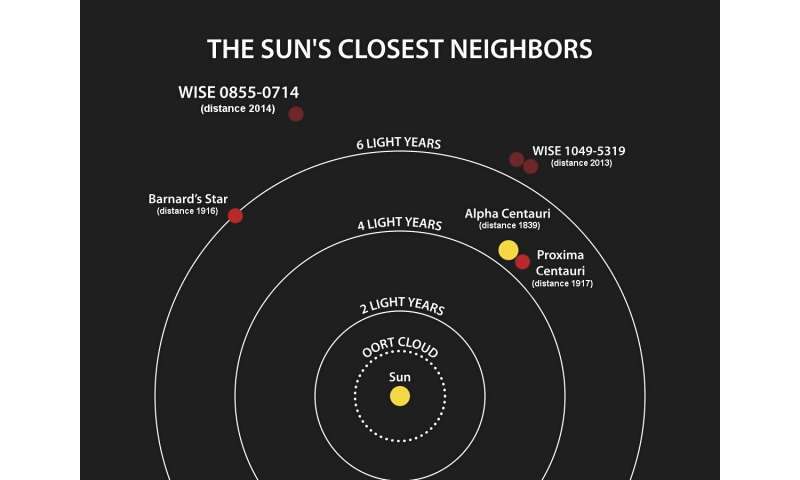 The closest exoplanet to us, if we include only single stars like the Sun, is the planet around Barnard's Star, Barnard's Star-b ("BSb"). (The planet Promixa Centauri-b is closer, but Proxima Cen is part of a triple-star system with Alpha and Beta Centauri, and understanding the evolutionary development of the planet is more complicated.) BSb orbits at a distance similar to that of Mercury around the Sun, but Barnard's Star is a cool M-dwarf star and so despite the planet being close to the star it probably resides near the snow line – the distance where stellar irradiation is weak enough to allow volatile elements to condense onto the planet's surface. This makes BSb an especially interesting planet and possibly a keystone for future progress understanding planet formation and atmospheric evolution. Extreme stellar activity and winds, especially in M dwarf stars, play an important role in the development of a planet and its atmosphere. These kinds of activity are linked to a star's magnetic activity, but unfortunately models are still unable to predict how atmospheric initial conditions evolve under intense radiation environments. Nevertheless, progress has been made using simple models. In the case of Proxima Centauri b, scientists have found that it is probably subject to wind pressures ten thousand times larger than occur at the Earth. Might stellar wind effects also be disrupting any atmosphere on Barnard's Star b? CfA astronomers Julian Alvarado-Gomez, Cecilia Garraffo, Jeremy Drake, and Sofia Moschou and their colleagues conclude otherwise. The scientists note that BSb is much farther away from its star than is Promixa Cen b, well outside of the domain of the star's corona. Moreover, an analysis of Barnard Star's rotation and other properties implies that it is much older, between about seven and ten billion years, and any magnetic field processes should be considerably smaller. The astronomers conclude that although today the planet Barnard's Star b may have a relatively mild space climate (comparable, nevertheless, to bad space weather conditions for Earth), in its early years it probably did undergo significant disruption. Today, however, BSb might retain an atmosphere that could be studied.